I don’t read “business books”. I may read books which were classified as “Business”, “Leadership”, etc; but, if I do, I do so in spite of the category they’ve been deemed to belong to, not because of it. 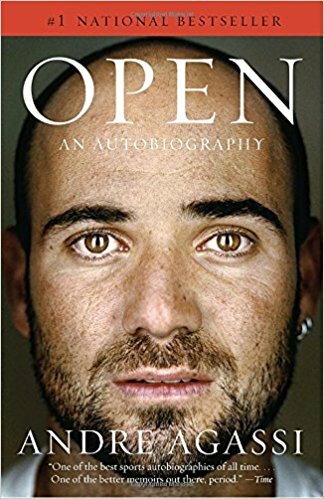 Biography/Memoir: Andre Agassi’s and J. R. Moehringer’s “Open“; Elizabeth Gilbert’s “Eat, Pray, Love“; and Salman Rushdie’s “Joseph Anton“. When written well, humor is blunt, but also refined and smart. I also love biographies and I really adored Open by Andre Agassi as it is a very honest and authentic summary of a successful career with all its ups and downs. It's amazing how transparent he is about his life — about times he used crystal meth and when he reached the highest levels of his sport; his emotions along the way. It's a story about the mental fortitude you need when you play a lonely game. It leaves you feeling more self aware, attuned to your own emotions and self management. It's one of the best books I've read about handling pressure and stress. I’m definitely a story-lover and maybe that’s why I like to read a lot of biographies. It’s fascinating to discover how people with different backgrounds, interests, businesses, careers have found solutions for various challenges from all areas of their life. Elon Musk, Andre Agassi, Phil Knight, Maria Sharapova, Arnold Schwarzenegger are only a few of good recent ones. A specific moment when I recall one of the inspiring stories is probably when I think I can’t anymore. I take a deep breath and move on. It’s only in our mind. We can always do a little more. I don’t just read business biographies. I’m a huge tennis fan, so I’ve read a lot of tennis biographies: John McEnroe, Pete Sampras, Andre Agassi, Scott Draper, Rod Laver. There’s so many I’ve read over the years, Jimmy Connors, great, I love it because I love reading the “behind the scenes” stories, the more “soap opera” aspect of tennis, I guess it’s a little bit like my soap opera sometimes. It’s the autobiography of tennis champion Andre Agassi. The alert and human way, almost brutal, in which this book is written makes for a very entertaining reading. Although it’s full of insights from the tennis world, it’s a great and inspiring read, even if you’re not a fan of the sport. He is one of the most beloved athletes in history and one of the most gifted men ever to step onto a tennis court – but from early childhood Andre Agassi hated the game. Coaxed to swing a racket while still in the crib, forced to hit hundreds of balls a day while still in grade school, Agassi resented the constant pressure even as he drove himself to become a prodigy, an inner conflict that would define him. Now, in his beautiful, haunting autobiography, Agassi tells the story of a life framed by such conflicts. Agassi makes us feel his panic as an undersized seven-year-old in Las Vegas, practicing all day under the obsessive gaze of his violent father. We see him at thirteen, banished to a Florida tennis camp. Lonely, scared, a ninth-grade dropout, he rebels in ways that will soon make him a 1980s icon. By the time he turns pro at sixteen, his new look promises to change tennis forever, as does his lightning fast return. And yet, despite his raw talent, he struggles early on. We feel his confusion as he loses to the world's best, his greater confusion as he starts to win. After stumbling in three Grand Slam finals, Agassi shocks the world, and himself, by capturing the 1992 Wimbledon. Overnight he becomes a fan favorite and a media target. Agassi brings a near-photographic memory to every pivotal match, and every public relationship. Alongside vivid portraits of rivals, Agassi gives unstinting accounts of his brief time with Barbra Streisand and his doomed marriage to Brooke Shields. He reveals the depression that shatters his confidence, and the mistake that nearly costs him everything. Finally, he recounts his spectacular resurrection and his march to become the oldest man ever ranked number one. In clear, taut prose, Agassi evokes his loyal brother, his wise coach, his gentle trainer, all the people who help him regain his balance and find love at last with Stefanie Graf. With its breakneck tempo and raw candor, Open will be read and cherished for years. A treat for ardent fans, it will also captivate readers who know nothing about tennis. Like Agassi's game, it sets a new standard for grace, style, speed and power.